It’s been three months already since the last time I wrote something ;) Time really flies by quickly when you are doing interesting stuff. We’ve been very busy with lots of improvements to the library as well as A LOT of tiny fixes: over the last three months the team eliminated virtually every bug found by various static analysis tools and valgrind. For the longest time, the low level implementation of the persistent free was very strict about putting things back where they belong and making everything tidy. That meant coalescing even the tiniest blocks, cleaning up large unused contiguous runs of blocks as soon as possible, putting the freed blocks back to the corresponding thread caches and a few more things. I think it’s sufficient to say that the free was more expensive than malloc, and what’s more, required a volatile pointer inside of the header of memory blocks. Managing that pointer was a huge pain. But that is all in the past now. In January, after long baking, we’ve finally merged a patch that significantly simplifies the free operation. Right now, in the happy case, a free is a flip of a few bits in a single 64 bit value. The performance gains are spectacular. The only not so great side effect of this change is that the freed blocks are now lazily repopulated in the volatile state of the allocator. This means that in sequence of malloc, free, malloc; the second malloc won’t return the same address as the first one, and the freed block will only become available once the current bucket (a thread cache) exhausts its currently cached memory blocks. Another change that was bundled in that pull request was introduction of a new slimmer header for objects, as well as a new cleaner code to handle customizable headers in the future. The new header is only 16 bytes in size (compared to the old 64 bytes), which means that from now on, a single allocation will waste 48 bytes less then previously. That’s a huge improvement if your application deals mostly with small objects. This new header, alongside the new customizable header code framework, will allow us to eventually introduce new very small allocation classes (8, 16 bytes) with minimal overhead and allocations aligned to arbitrary sizes. The transaction range cache is the place where the snapshots of memory blocks are placed. It was introduced to reduce the number of allocations performed during an average transaction. 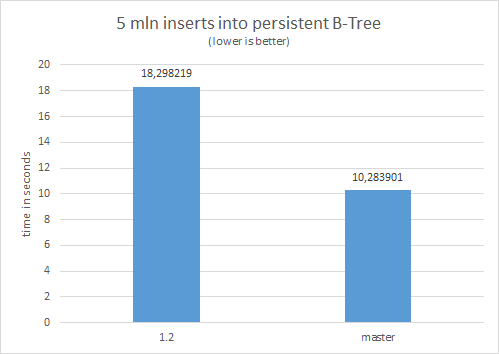 Instead of calling the persistent malloc (a very expensive operation) every time the user wanted to modify a memory region, the library had a preallocated buffer to which the snapshot landed. However, there was one small issue with the implementation: only regions no larger than 32 bytes were benefiting from this optimization. The reasoning for that was a) it made the implementation far simpler and b) the cost of memcpy will overshadow the allocation cost for larger blocks. 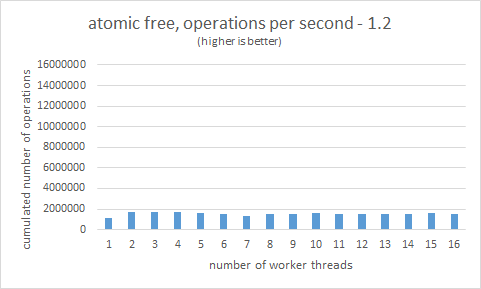 The second reason turned out to be not true at all, and in this patch we’ve managed to maintain a fairly simple implementation of the cache while allowing for arbitrarily sized ranges. I’ve explained this one fairly well in my previous post, but here’s the recap: The plan was to allow for worker threads (one or more) that cleaned up the leftovers after a transaction successfully commits, allowing the main task to move forward. This is a result from a synthetic benchmark I’ve devised. 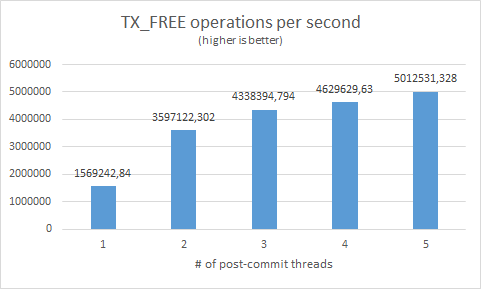 It preallocated certain number of objects, and then, in a transaction, called TX_FREE on those objects. For each run of the benchmark, the number of post-commit workers increased. 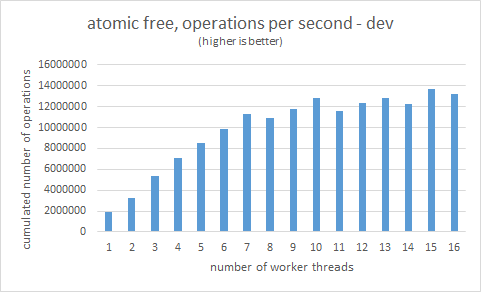 On the chart here we can see that the optimization is indeed worth while, at least for workloads that do a lot of big transactions. There’s a more in-depth explanation of the feature, as well as some more benchmarking results, here. We’ve been busily trying to optimize the allocation and class generation algorithms toward the goal of minimizing overall fragmentation of the heap. In it’s current state I’d say the fragmentation is fairly OK in the general case ;) The issue however, is that the algorithm was heavily skewed towards optimizing for small allocations, and everything after a certain threshold was bundled together in the “big allocations” bucket, where the requested size was rounded-up to the size of a chunk (256 kilobytes). This resulted in a very inefficient use of space when allocating big blocks of memory that happened to be only slightly higher than the chunk (for example: 257 kilobytes). The charts show the percentage of internal fragmentation for sizes between 100 bytes and 4 megabytes with the interval of 100 bytes. The first initial spike (80%) is due to granularity with which we can allocate memory: 64 bytes. 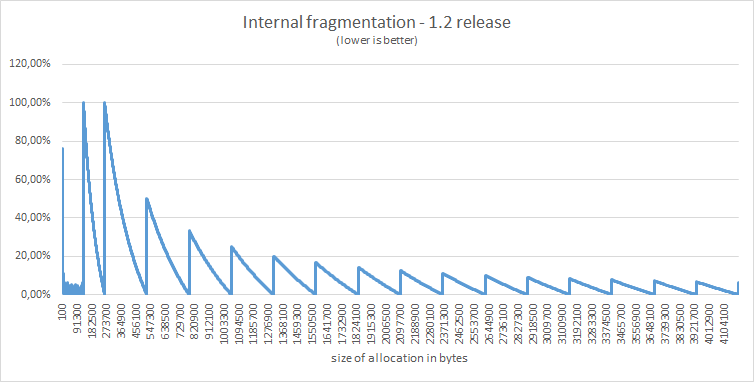 The 100 byte allocation receives 196 bytes buffer, and so the internal fragmentation is fairly high percentage wise. This is only true for very tiny allocations. 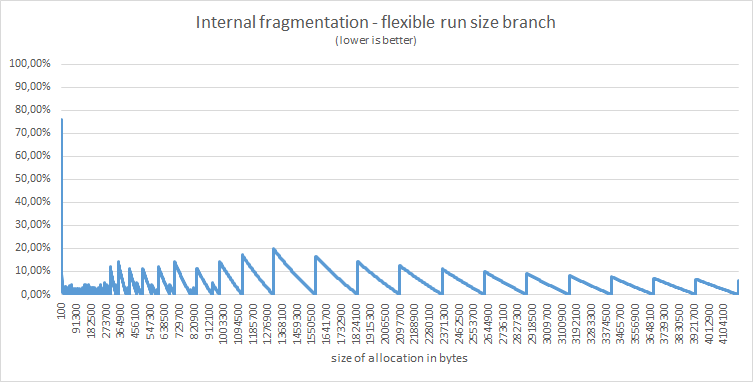 All allocations between 100 bytes and 132 kilobytes have, on average, internal fragmentation smaller than 5%. 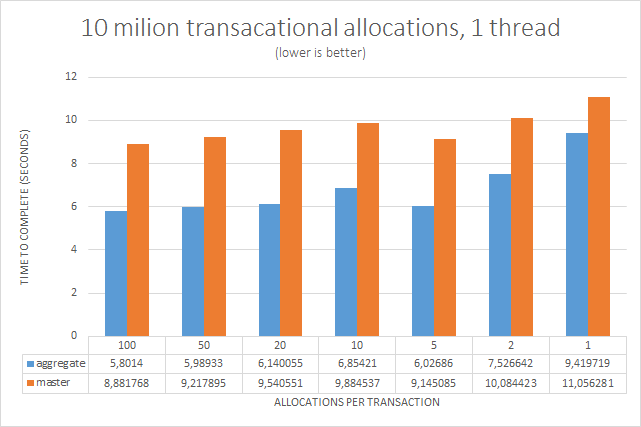 On the first chart the heap works with only 30 allocation classes, and the second chart shows a situation with 70, but spaced more apart, and with a bigger focus on the huge allocations. There’s a bit more technical information here. The process of persistent allocation is, and always was, divided into two steps: volatile reservation and persistent publication. The first part is very quick, and could be done many millions of times per second, whereas the second part is slow and requires numerous cache flushes, dragging down the overall performance of the allocation process. This is an opportunity for optimizations in the workloads where many allocations are performed in a single transaction, and so the expensive part of the allocation, the persistent publication, is aggregated so that we can achieve maximal possible throughput. 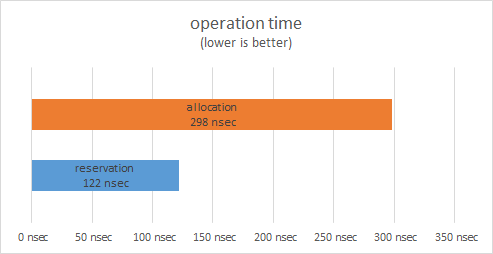 Not bad ;) Even the workload in which only one object is allocated per transaction has improved, this is a result of slightly better allocation undo log handling that was enabled by the work done in this patch. And lastly, we are in the process of adding a new API that will unlock a new set of problems to be solved using libpmemobj. This new API builds on top of the ideas mentioned in the previous section, namely the separation of the allocation into two distinct steps. This can be used in many different ways, the most promising being the ability to parallelize related work in a single transaction. I’m currently working on an example that will demonstrate how one can achieve near-volatile performance from a persistent container using this API (and some threads :P). For anyone wondering, all the benchmarks were performed on my development PC: Core i7-6700K, 32GB RAM, Ubuntu 16.04 LTS /w 4.4 kernel. The file system was always tmpfs with PMEM_IS_PMEM_FORCE=1. As always, feel free to contribute your own ideas here, we are always open to community suggestions.